The LeCroy WaveRunner Xi with its advanced triggers, fast viewing modes, measurement parameters, and serial decodes makes validation and debug simple and easy. Advanced debug, multi-domain analysis, and waveshape analysis are possible with tools unique to WaveRunner Xi, Building on the features and capabilities of the WaveRunner Xi the WaveRunner 104MXi provides a higher level of analysis, measurement and customization tools, making it the most powerful and capable oscilloscope in its class. The collection of tools, features an functions packed into this small 6" deep instrument with large 10.4" touch screen make the WaveRunner 104MXi a truly unique oscilloscope. With a maximum sampling rate of 10 GS/s (5 GS/s per channel) you can be confident in all your measurements knowing that even the fastest signals in your device are being captured. High sample rate is important for fast signals and edges but without long memory this rate cannot be maintained for long captures. The 25 Mpts (12.5 Mpts/Ch) fast memory guarantees maximum sample rate for 2.5 ms. Beyond the impressive specifications, the WaveRunner 104MXi provides a set of tools like no other oscilloscope. Use WaveScan to search through a single capture for a rare event, or scan through live data acquisitions. The LabNotebook report generator lets you quickly share findings with others and even allows you to make hand written notes directly on top of the signals. With the advanced math and measure tools you can look at every aspect of your waveforms and understand the distribution of measurements with histograms of up to 2 billion events, trends of up to 1 million measurements and a track function that shows variations in signals over time. Adding to the flexibility of th WaveRunner MXi is the ability to create your very own customer or proprietary measurements, math functions, filters or scripts and run them directly in the oscilloscope having results displayed in real time. 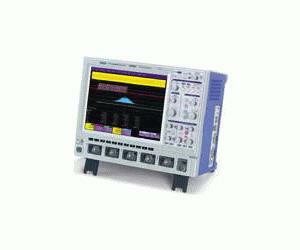 Add high-performance mixed signal capability to a WaveSurfer MXs. Capture digital signals up to 500 MHz with up to 50 Mpts/Ch memory, 2 GS/s, and 18 or 36 channels.